Our range of products include custom wire coil springs, custom flat wire springs, wire torsion springs, wire tension springs, wire forming springs and wire coil springs. 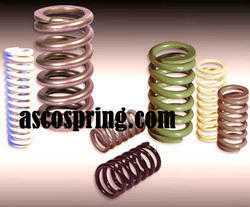 Asco Springs manufacture and supply an excellent quality assortment of Custom wire coil springs. Asco Springs offered Custom wire coil springs are required in wide range of applications and and known as a significant component for engineering, tools, automobiles, aerospace, consumer applications, and the likes. 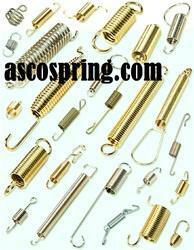 Our comprehensive array of compression springs provide resistance to heavy force applied on it axially. Bar Dia. : 0.50mm Upto 10mm. Out Side Dia. : Upto 250 mm. Total Length: Upto 1200 mm. Total Coils: As required in closed condition without any gap. Raw material: All suitable quality Spring Steel. Owing the team of expert engineers and workers, we are engaged in offering high quality range of Custom Flat Wire Springs. These are widely used in various applications and are manufactured as per the requirements of our clients. Further, the raw material used in the manufacturing is procured from the reliable vendors of the industries. We offer our clients Wire Torsion Springs are used to apply a torque or store rotational energy. These are used to apply a torque or store rotational energy. Further, wire torsion springs wind up they reduce in diameter and their length becomes longer. Available in various specifications, these can also be customized as per the clients specific requirements. Our clients can avail from us a wide range of Wire Tension Springs which is available with the bar dia. capacity upto 14 mm. Wire Tension Springs are manufactured using premium quality raw material and are widely used in electrical components such as automotive interiors and exteriors, garage door assemblies, vise-grip pliers, carburetors, trampolines, washing devices, farm machinery and toys. Our products are available in various shapes & sizes and can also be customized as per the client’s specifications. We are engaged in offering wide gamut of fine quality Wire forming Springs that is fabricated from quality material that is available in various specifications as per the clients requirements. Further, these are made using premium quality of raw materials and are also durable and robust in design. Available in various specifications, Wire forming springs can also be customized as per the clients requirements. 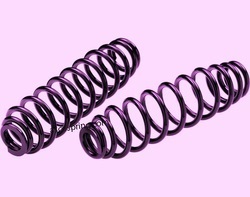 Asco Spring are a prominent manufacturer of wide range of high quality Wire Coil Springs.Wire Coil Spring are designed with the help of superior quality raw material secured from some of the genuine vendors of the industry. Wire Coil Spring are in compliance with the international quality standards. Our valued clients can avail these products from us at industry leading prices. Furthermore, our products are known for various salient attributes such as resistance against abrasion, durability, high performance etc. Bar Dia. : 1mm Upto 80mm. Out Side Dia. : Upto 220 mm. Total Length: Upto 1500 mm. We engaged in offering wide gamut of fine quality Wire Compression Springs that is fabricated from quality material that is available in various specifications as per the clients requirements. Further, these are made using premium quality of raw materials and are also durable and robust in design. 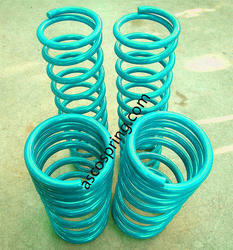 Available in various specifications, Wire Compression Springs can also be customized as per the clients requirements. Looking for Wire Springs ?